We Americans like our outlaws. Jesse James, John Dillinger, Butch and Sundance, Bonnie and Clyde — these figures fascinate more than they repel. They emerge as folk heroes during times of national conflict, economic struggles and political strife. We call them outlaws rather than criminals, and they often become beloved and protected by their communities even when they are pariahs to the established powers. With his series of “Street Bible” prints, Jackson, Wyoming, artist Aaron Wallis seeks to add a list of gangsters, drug dealers and rap stars to this folk-hero pantheon. Wallis’ ongoing project, much of which is on exhibit at Mestizo this month, uses the visual language of Christian hagiography to turn America’s urban legends into urban icons. Photo transfers of rappers like Notorious B.I.G. 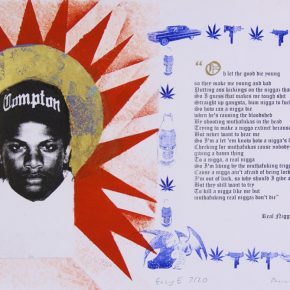 and Russell Tyrone Jones, and gang leaders like Crips co-founder Stanley Tookie Williams III, are embedded in the colorful and intricate style of illuminated manuscripts, and accompanied by texts detailing their lives or expressing their “gangsta” ethos. All of them are colorful figures, dynamic individuals who frequently lived and died violently and in the process became urban legends. 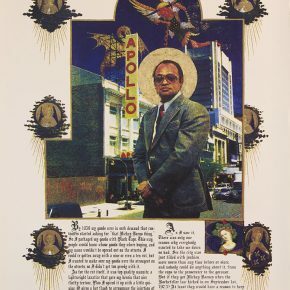 There’s Leroy “Nicky” Barnes, the ‘70s drug king who appeared on the cover of The New York Times Magazine, where he was called “Mister Untouchable.” In Wallis’ print, Barnes appears as he did in the Times Magazine profile — proud, defiant, looking more like a captain of industry than a captain of infamy. He’s seen in front of the Apollo Theater in Harlem, where his crime organization, The Council, controlled the distribution of heroin in an organizational structure based on Italian mob families. Barnes’ head is surrounded by a chine-colle halo of gold leaf, and above the theater an Archangel Michael is seen slaying the dragon. In the caption embedded in the print, Barnes describes the production and marketing techniques that made him the king of heroin; and how supporters surrounded him on the streets of Harlem, encouraging him to “stick it to the man” by beating the newly instituted Rockefeller laws (which helped spur the mass incarcerations that have become part of the ”war on drugs”). 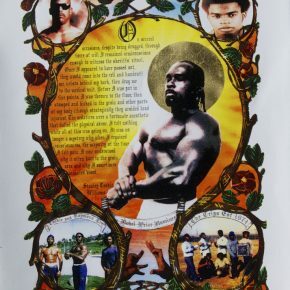 Through his success and defiance, Barnes became an icon of urban, ghetto power; so while a mainstream audience might see Barnes as the dragon to be slain, in the “counterculture deification” process Wallis examines in this series he’s actually the archangel. Felix Mitchell was another dealer turned folk hero. He took over the streets of Oakland, Calif., from the Black Panthers in the late ‘70s and reportedly sold $800,000 worth of heroin a week. He also became known locally for his philanthropy and community involvement. He eventually was sent to Leavenworth, where he was stabbed to death in his jail cell. 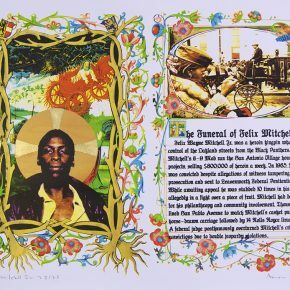 At his funeral, thousands of people lined the streets as his procession, complete with horse-drawn hearse (depicted in Wallis’ print) and Rolls Royce limousines, went through the streets of his neighborhood in Oakland. Wallis sees his sanctification process as an “act of resistance” at a corrupt, for-profit prison and police state. There are undertones of this in his portrayals of Barnes and Mitchell, but his most subversive act of resistance may be his portrait of Freeway Rick Ross, a dealer who moved hundreds of millions of dollars worth of cocaine in the ‘80s but had a reputation as a clean-living “Robin Hood” figure. 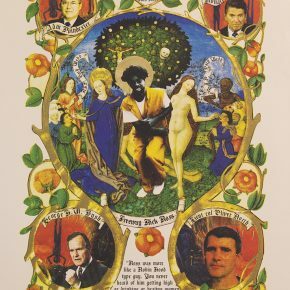 In the “Street Bible” print, a smiling Ross is shown cavorting in a garden with Mary and Eve, while Ronald Reagan, Adm. John Poindexter, George H. W. Bush and Oliver North are shown as devils in the four corners of the image—Ross was busted in 1996 and given a life sentence, but it turned out the supplier turned FBI-informant who set Ross up was Oscar Danilo Blandon, a drug smuggler and arms dealer who was the link between the CIA and Contras during the Iran-Contra scandal. On appeal it was determined Ross was over-sentenced and his time was reduced to 20 years. By contrast, for his part in the Iran-Contra scandal, Oliver North got a fine and community service. John Poindexter’s six-month sentence was reversed. Reagan and Bush ran the free world. Wallis’ hagiographic project is compelling, though problematic (if a middle-class white guy in Salt Lake City can make such a critique). As philanthropic as some of his subjects may have been, they were gangsters and dealers, and some of them murderers. Like mafia dons who provide stipends to the widows of their victims, their money and deeds come tainted with blood and pain. And their Robin Hood persona was sometimes a mask. 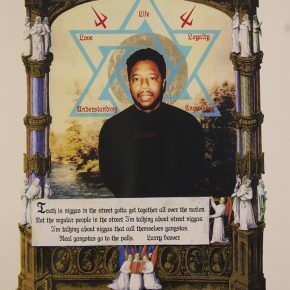 Larry Hoover, head of the Chicago street gang Black Gangster Disciple Nation, also appears in the series. Apparently a natural-born leader, he was in his early 20s when he became the leader of his Chicago gang, and after he was convicted of murder and sent to prison, he continued to amass followers. Behind bars he portrayed his movement as political rather than criminal—in the caption in Wallis’ piece he says, “Real gangstas go to the polls.” Ultimately, however, it was discovered that Hoover continued to lead a criminal organization from behind bars — his attempts at reform a pitch for parole, his pretence of philanthropy a front for money laundering. More problematic is a portrait of Joaquin Guzman, the infamous leader of the Sinaloa drug cartel (who recently escaped from prison). “El Chapo” is seen on a Mexican banknote of 1,000 pesos. Where we might normally find a national motto or inspiring quote, the print reads “No sere’ el Presidente de Mexico pero en Mexico soy el jefe” (I may not be the President of Mexico, but in Mexico I’m the boss). Felix Mitchell’s and Nicky Barnes’ appeal may be explained by the fact that among the downtrodden and destitute, any sign of success, criminal or otherwise—especially one that spits in the eye of the oppressor—may be reason for street beatification. It’s harder to make that argument when the criminal seems to be running the country. And running it into the ground. Crips co-founder Stanley Tookie Williams, shown in Wallis’ print in his full muscular glory, understood this dilemma. In retrospect, at least, he said he was organizing the Crips as an attempt to improve his community, to “cleanse” the neighborhood of “marauding gangs.” But, he said, “we morphed into the monster we were addressing.” The Mafia in Italy has a similar origin story. They like to say they were formed to fight back against oppressive foreign invaders, but they have long-since become the oppressors themselves. We have come to “adore,” in a sense, our own outlaws of the Old West, as well as the white mobsters of New York, Las Vegas and Atlantic City —they are the subjects of some of our favorite books and films. The African-American outlaws of Wallis’ series have yet to be welcomed into our national pantheon. Even as folk heroes they remain in the ghettos they were born into. Wallis’ “Street Bible” may help change that, as undoubtedly will the current biopic on N.W.A. (Dr. Dre, Eazy-E, Ice Cube, MC Ren and DJ Yella are all part of the “Street Bible” series). You may have to visit the exhibit, and read a bit about its subjects to decide if that is a good thing. Hagiography is a process of sanctification, but also of simplification. We render the lives of those we adore in shades of black and white. But the nuances of these lives are far more interesting, if not always morally edifying. Nicky Barnes’ audacity so enraged President Jimmy Carter, that he thrust the full power of the Justice Department at the Harlem network and Barnes was eventually put away on a life sentence; when he was betrayed by his partners on the outside, however, he became a witness for the government and earned a reduced term. He also earned a college degree with honors, a national poetry contest for inmates and taught English in prison. Posthumously, Felix Mitchell’s conviction was overturned on technicalities, and his name was given to the “Felix Mitchell Paradox,” a phenomenon where crime and violence actually go up rather than down after a major police operation, like the arrest of Mitchell (it’s believed that Mitchell’s arrest left a power vacuum that smaller gangs fought violently to fill). When Rick Ross eventually was paroled he unsuccessfully sued for the use of his own name – appropriated by rapper William Leonard Roberts II. 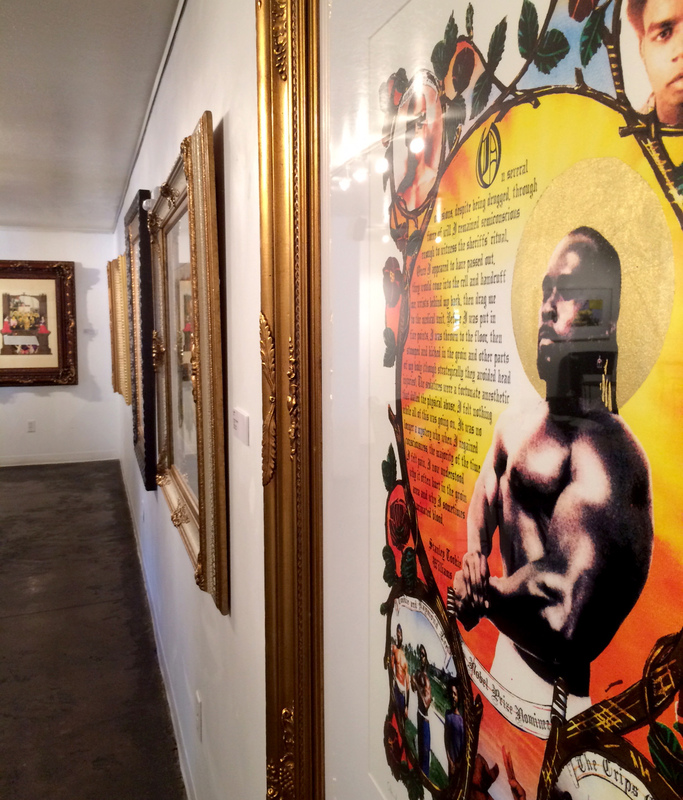 The Street Bible, prints by Aaron Wallis, is at Mestizo Institute of Culture and Arts in Salt Lake City through October 24. This article appears in the October 2015 edition of 15 Bytes. It happened that I was in Orange County when Stanley Williams was executed in 2005. A lifelong opponent of capital punishment, I was sympathetic to the claims of his supporters that his anti-gang work while in prison argued for sparing his life. What I discovered, though, was an almost carnival atmosphere among the many who remembered the terror of the Crips and Williams’ killings, who threw all-night block parties on the night he died. The story of ‘the Troubles’ in Ireland fits this profile as well: only when the British and Irish governments realized that what had begun as a civil and religious dispute had become a hardened case of organized crime was it possible to break the hold of violent gangs on both sides and win a peace that, while still not fully resolved, has held since. I love to see art address issues such as these, but hope for two sides (at least) and a healthy varnish layer of good-old aesthetic ambiguity. I have two pages of the street bible by Aaron Wallis…love them so much. Just happened to wander into the Mestizo Gallery and I was stunned by his work. How he survives in Jackson is a mystery… I am so glad to have gotten to know him..just a little bit.